Oh yes.. finally my mom changed my blog's look!Isn't it pretty? !I had to beg her to put up Christmas stuff on!!! My brothers got it on too! Check it out! Click for Ethan and Shaun's blog to see. My mom however, is not decorating hers yet! She made it already I don't know when she want to hang it on! but she's whining about it! She like to put it on but undecided huh mom's, sometimes' u just can't understand them! My daddy is coming home tonight!! yes! I can't wait! 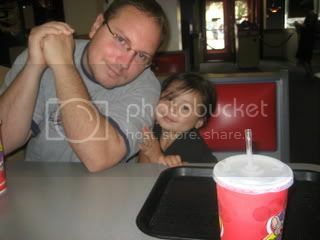 I miss my dad so much!I just hope that my Brother Ethan will feel better, his fever is kept coming back! !It would be great if he will be back to normal, fever & cough free!!!! Wow! paskong pasko na gyud nimo dinhe cutie girl, ka nindot na lang sa imong balay nga napanday sa imong mother,good job sa imong Mama Irel. take care and have a great week-end. hi...you looks like your daddy...very pretty!